Kolkata: The Trinamool Congress has set an example before all the other political parties in the country regarding how to conduct a rally where almost half-a-crore people are expected to take part with clock-like precision. The state administration is looking after the security arrangements and overseeing the construction of the main stage and four other stages at the Brigade Parade Ground. The party leaders are running a parallel administration to ensure that TMC workers who have come to attend the rally from the districts do not face any inconvenience. 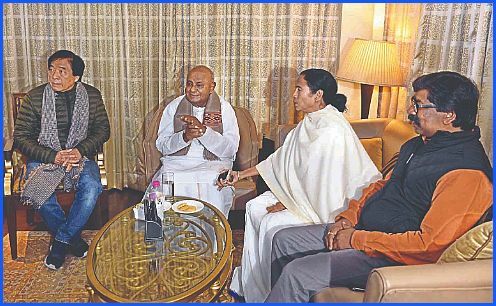 Despite her busy schedule, Trinamool Congress supremo Mamata Banerjee is keeping a tab on each and every arrangement. She had visited the Brigade Parade Ground on Thursday to take stock of the security arrangements. Thousands of party workers have come to Kolkata from far off districts including Alipurduar, Cooch Behar, South and North Dinajpur respectively. As soon as the party workers reach Sealdah Station, they will be ferried to Central Park where 50 camps have been set up. A dedicated corridor has been prepared for the VVIPs from the hotel to the venue. The camps have bio-toilets, medical camps and the visitors are being served food as well. Sujit Bose, minister of state for Fire and Emergency Services, who is looking after the camp said no compromise has been made with the cooking medium. The medical camps have been manned by doctors and medicines for indigestion, loose motion, pain and common cough and cold have been provided. The Trinamool supporters have been put up at Gitanjali Stadium and Uttirno. In Howrah, they have been put up at the stadium where state Cooperation minister Arup Roy and Minister of State for Sports and Youth Affairs Lakshmi Ratan Shukla are looking after the make-shift kitchen. Roy said: "Fifty thousand party workers are staying at the stadium. We are looking after them and quality food is being served." Jyotipriya Mallick, the state Food minister added: "We are not only welcoming our party workers but we will be there at Sealdah and Howrah stations to see them off too." Senior party leaders including ministers and MPs were deployed to welcome the national leaders who started arriving on Friday afternoon. Subrata Mukherjee went to the airport to receive former Prime Minister H D Deve Gowda. Saugata Roy was there to welcome Sharad Pawar while Shatabdi Roy welcomed BJP MP Shatrughan Sinha. Binay Tamang, president of the Gorkha Janmukti Morcha (GJM) and Anit Thapa, general secretary, GJM, will be sharing the stage with Chief Minister Mamata Banerjee at the Brigade Parade Ground on Saturday. "BJP has betrayed the Gorkhas. They have played with our sentiments. Our presence at the Brigade Parade Ground will be a befitting answer to the saffron camp," stated Tamang. Relations between the GJM and the BJP got strained over issues including a separate state. The BJP's silence during the 105-day bandh in Darjeeling in 2017 and inclusion of 11 Gorkha sub-communities in the Scheduled Tribe list despite Darjeeling having a BJP Member of Parliament has also contributed to the alienation. The Trinamool Congress has set an example before all the other political parties in the country regarding how to conduct a rally where almost half-a-crore people are expected to take part with clock-like precision.